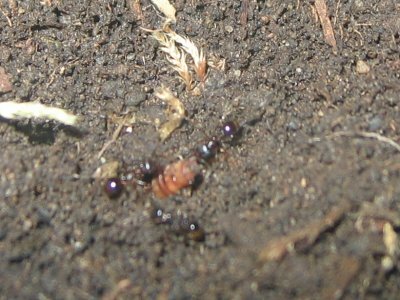 I thought the ants were dragging something into their tunnels, but it turns out that they've actually started dragging things out. They've dragged out bits of dirt, moss, seeds, and other stuff that apparently got in the way of their tunneling. If you look at the dirt around the hole, you can see that it's all pebble-like; that's dirt that they've dug up. I've noticed that my ants work in shifts. That is, the whole time they were digging stuff out of their tunnels (about 2 hours worth of work), they completely ignored the crane-fly that I recently dropped in there. I had expected them to split up the job, so some of them would be working towards getting the crane-fly, and some would be working towards the excavation project... but I suppose that would be rather counterproductive -- they can't very well get stuff into the tunnels at the same time they're trying to get stuff out of them.